Ok, ok I admit to being a mean, nasty, no good person. I’m positive that you’re vehemently disagreeing with me right now and saying, “No Muse! No! We love you and think you’re the sweetest thing since gumdrops and lollipops! Why would you say you’re a mean, nasty, no good person!?!? Not our Muse! Can’t be!” Ok, maybe I exaggerated a little bit there. Well, I recently purchased E.L.F. Tinted Moisturizer and I was kinda hopeful that I’d be able to body slam it around in a review. I know, I’m deeply ashamed of myself but I was kinda feeling the vibe to trash dollar makeup! I really can’t help myself. Forgive me please!? I’m semi-ashamed of myself. Kinda, sorta. Well….the bad news is I won’t be able to trash it for you! Damn it, I’m so bloody disappointed! I really was looking forward to doing this review and making all sorts of sarcastic, catty comments! 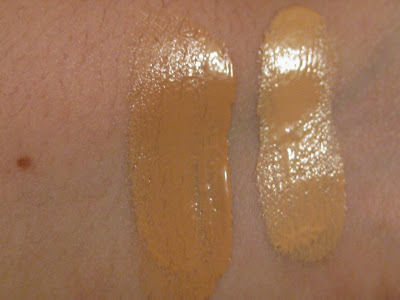 The good news is that you can actually get a decent Tinted Moisturizer for a buck…whoa….. 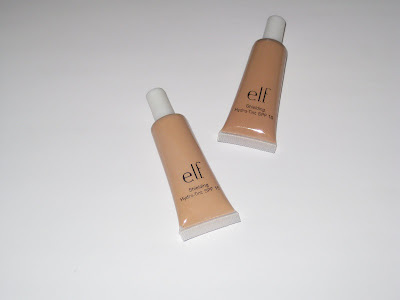 I decided to take the dive into cheap cosmetics when I seen E.L.F.’s rather hysterical promo comparing it’s newest tinted moisturizer to Laura Mercier’s Tinted Moisturizer. Umm…..major claim to leave up to as the Muse heart’s Laura’s version in a big way! Well, E.L.F. kinda sorta made a big claim and honestly they have created a product that actually works as promised. I’m not sure I’d compare it to Laura Mercier Tinted Moisturizer as the products are quite different but I will say that it’s good with some minor problems here and there. I purchased two shades of E.L.F. 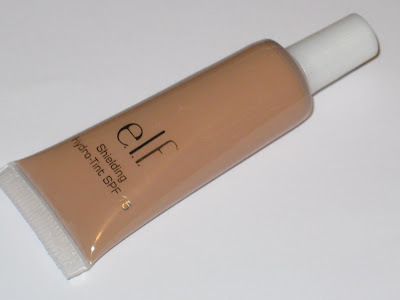 Tinted Moisturizer, oh sorry it’s actually called E.l.F. Shielding Hydro-Tint, silly Muse! There are four shades available so I decided I’d buy Tone 1 and Tone 2 but honestly I should have just stuck with Tone 1 as that was exactly the right shade for me but hey it was only a buck, no pain, no gain! Ok, two major or minor complaints are the fact that this contains parabens and secondly the scent is really foul-tastic. I think they were going for a fresh scent but it comes across as really cheap, old cosmetic smell to me. It’s a cross between plastic and flower and so NOT pleasant. Guess what? That’s the only rants I have! GASP! SHOCK! Oh my! Honestly, the product is not bad at all and it works. 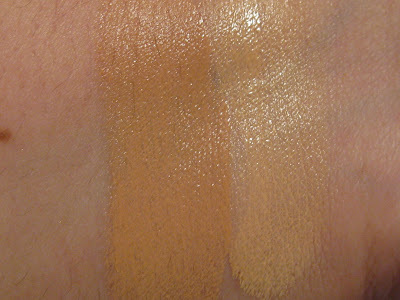 I wouldn’t necessarily classify this as tinted moisturizer though considering that it is pretty pigmented. Honestly, depending on how you see it that could be a good thing or a bad thing. The coverage is actually really good and falls into light coverage at the very least or even medium if I press the matter. The formula is good as well, not too thick, not to runny but nice and creamy with a certain thickness that feels quite nice on the skin. It absorbs well and leaves behind a nice canvas for makeup. It’s pretty long wearing too and during a full day will last about four hours before needing a bit of a refresher. Seriously, when have you seen tinted moisturizer last longer anyway right? 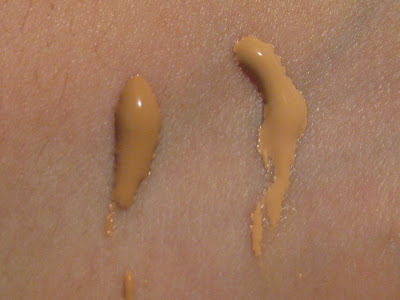 I think for the most part tinted moisturizers are just that, a moisturizer that’s tinted. When you’re looking for a good tinted moisturizer I think you’re seeking a sheer coverage plus added moisturize for your face which is why I don’t place E.L.F. 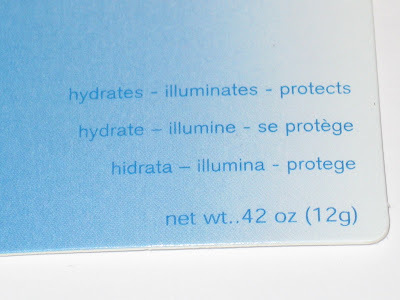 Shielding Hydro-Tint in the tinted moisturizer category. 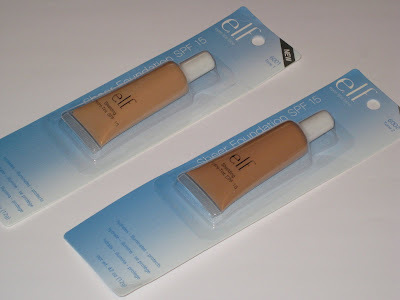 I think E.L.F.’s version would probably fall more into the lines of a liquid foundation if anything else as the pigmentation is good enough to work as such. Granted if you have problem skin or you need more coverage this obviously won’t give that to you however in the long run if you’re just doing a quick look and running out the door this works a treat at creating a good finish to skin. Granted even though it does have good qualities it has a certain cheapness about it that I can’t explain or this may be accounted for the fact that I’m purely a snob about makeup. Overall E.l.F. Shielding Hydro-Tint does successfully what it promises. It honestly works well with a few minor rants that I mentioned above. I’m unsure if I’d repurchase it again myself but setting aside my bias opinions about cheap makeup, I will say it’s sorta worth checking out for yourself. Hmmm maybe I should indulge further…honestly I was shocked that the TM was so good! Ugh I know this stuff smells SO bad..the concealer has the same smell. Honestly, I love to buy drugstore makeup.. (holding an umbrella in case of bashing emergency..) but I like to indulge myself once a while by buying high-end makeup if I have the bucks. Once in a while, I could find diamonds in drugstore and fall in love with them. Thanks to your review, the next time I go to US, I will def check out E.L.F and milani. did you at least like the coverage on this Tammy? No problem, my pleasure 😉 Milani is fabs 🙂 Very good line of cosmetics and cheap yay! I’ve definitely found their cosmetics and brushes to be hit or miss. Some good, some bad. I have their eyelash and brow wand that I use to help separate my eyelashes after I apply mascara, and I like it. I have their blending eye brush and it feels so scratchy on my eye that I don’t use it. 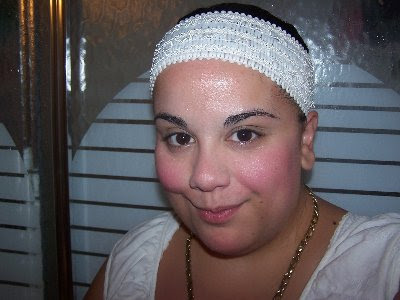 I did like their shimmering facial whip in Pink Lemonade. 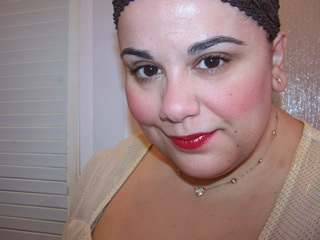 However, I hated their eye shadows as they all seemed to lack pigment and were too light. Thanks for the review, Muse! Although I am such a beauty snob…but I feel like in this economic climate I should give it a chance? On a daily basis, I use maybe two products that are from a drugstore (Rimmel Kohl eyeliner…it's a staple). P.S. Just a fun suggestion for a review: http://www.sephora.com/browse/product.jhtml?id=P223432&shouldPaginate=true&categoryId=3865 – I fully plan on indulging, since this looks like a fun set to get me out of my neutral zone! thanks so much for the review! I’ll definitely give this a try. 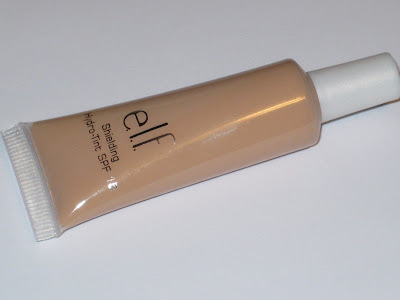 I’ve tried a couple of elf stuff before and the products that I really like are the healthy glow bronzing powder, tone correcting concealer and eyeshadow brush. You’re most welcome 🙂 They do indeed get to Canada yay! I’m a snob too but at this rate we all may have to settle for dollar makeup..the economy is scary to say the least! I honestly don’t use any ds brands in my daily routine so I can totally relate! Tis really good 🙂 Review upcoming soon! Phew thank goodness *hugs* I’d never want you to think I was awful hehe! Wow, did I feel the earth move or what??? I was fully expecting a bashing when I read the title to this post! In these economic times, I suppose it is good to find beauty on a budget… I actually like to find a bargain! I really wanted to bash but damn it all it was actually not bad! Wow, this is an interesting read, LoL. I’ve heard some pretty bad stuff about the quality of E.L.F. products. I have to say that even though it sounds alright, I’m still snobby to get it. I’m a “cosmetics snob” too, kiki. hi darknyx! how are you!? I have too..but this wasn’t as bad as I thought it would be! I’m WAY snotty about cosmetics my dear so I can totally relate! Cheers dark_nyx! Thanks for your great comments!